Bread is not for the dabbler. At least in my mind, the sponges, starters, and not least, the yeast aren’t terribly friendly to the uninitiated. I have recently worked around bakers and it really made me want to come home to freshly baked bread. My last experience baking bread was a 14 hour French loaf debacle that made me appreciate the $2.99 loaf all the more. After that I left bread in Joanie’s capable hands. Lately I’d seen a few ciabatta recipes and thought it was time to give it a shot. The biga, the sponge or starter, was particularly distressing but I decided to go ahead with it anyway. From what I had gathered from the 1999 Bon Appetit Ciabatta recipe and the March Cook’s Illustrated (subscription required), this particular bread was not the easiest customer. After bouts of procrastination and general dread, the biga began. From the outset, it wasn’t behaving as I’d expected. Why did they have me proof the yeast in the food processor? When exactly was it supposed to start forming small clumps. How about one big clump with a few small ones? It would have to do because I was concerned about my food processor getting gummed up. Perhaps I’m too protective of it, but give me a break it was my first grown-up kitchen appliance. My fear turned out to be well-founded: biga got all up inside the blade and fixed spinner thing. I hope I got it all out. Feeling somewhat accomplished, I let the biga sit, chilling and covered, for two days until the next move. It didn’t look right. Distress. 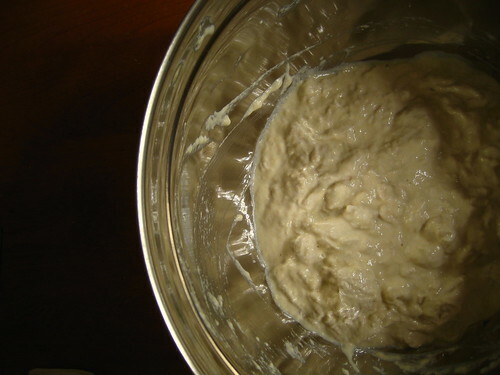 It never got a “thick oatmeal texture,” so much as a dry unbaked bread texture. Convinced of failure I forged on, dutifully kneading with one hand; making the quarter turns (clockwise, though the recipe didn’t specify); waiting ten, and twenty minutes at a time. The dough rounded the bend, so to speak, when I turned it out onto the semolina-d cutting board. It finally started looking like dough and my heart lifted. The first dough half to be transferred to the baking sheet did not go willingly (I was stingy on the semolina and ended up manhandling it a bit). The second did, I dimpled both and set them in the waiting oven. Twenty minutes later I had real bread. Made by my own hand. They cooled and I cut them open to see if Cook’s Illustrated would prove its authority again: they warned of giant air pockets. The first loaf was gorgeous (if I do say so myself): compact but with a nice crust and chewy crumb. The second loaf, however, was one giant air pocket with hardly any crumb. Much more like a pita than anything else. 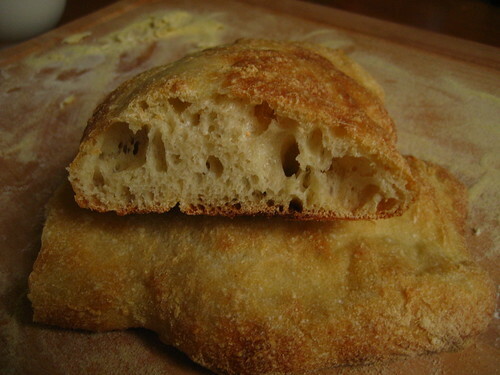 Fifty percent success on my first try isn’t bad on something so alchemistic as bread. I will try the Cook’s Illustrated recipe next to see if adding milk makes it more consistent. Skip is a producer at The Gourmetro. He lives, of all places, in Birmingham, Alabama where he has fallen in love with his newest kitchen gadget: an ice cream maker. He hopes the food processor doesn’t get jealous. You can read more at bhamsandwich.com and aisle-9.net. WAIT a second. Was I part of the French loaf debacle? Because I do not remember it as a debacle. Anticlimax, perhaps more so than debacle, would have created a better image for the french bread experience. It was just all the kneading and punching and waiting and waiting and kneading and punching … And yes, you were part of it. The company was wonderful.